Our President, Penny Hackett was interviewed for this editorial piece for the Sydney Morning Herald that was published on Wednesday 10 April 2019. In an ideal world, everyone would experience a ‘good death’ – pain free and without trauma. With scientific and medical advancements curing diseases and prolonging life, we are living longer, but not always in a desirable state. On top of pain, nausea and breathlessness comes the loss of independence and, sometimes, the inability to eat or communicate with loved ones. Unfortunately, even the best palliative care cannot address all suffering at end of life. An overwhelming majority of Australians agree that with the right protocols and laws in place, people should have far more control and say over how, and when, they die. 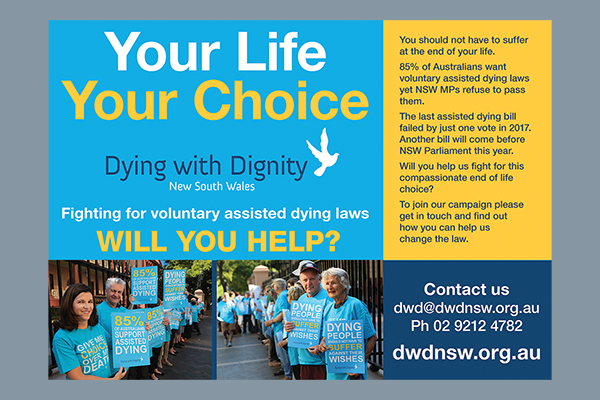 Formerly the Voluntary Euthanasia Society of NSW, Dying with Dignity NSW is an advocacy group which has been campaigning for voluntary assisted dying laws for more than 30 years. Its president, Penny Hackett, has read more than 4000 messages to MPs. Many of those messages are testimonials from traumatised family members who have witnessed the excruciating demise of a loved one. ‘‘It’s hard to understand how members of parliament can ignore these messages,’’ she says. 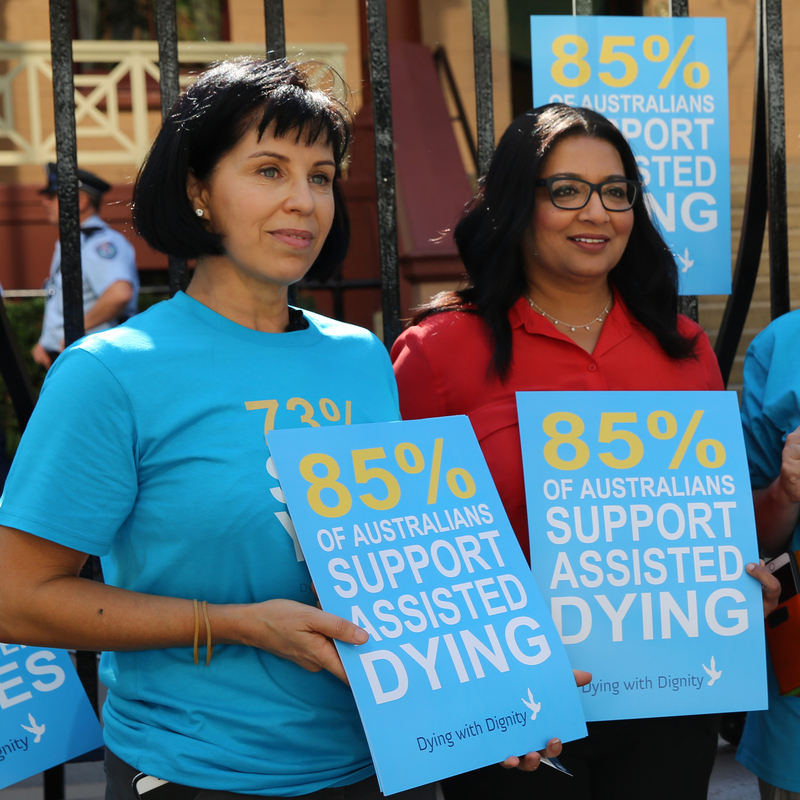 When Roy Morgan surveyed Australians in 2017, 85 per cent of respondents supported voluntary assisted dying, up from 74 per cent in 1996. This includes frontline service workers such as members of the Australian Nursing and Midwifery Federation, which supports legislative change. High rates of suicide among the elderly and terminally ill prompted former Western Australia Police Union president George Tilbury to last year publicly support legislative change, saying too often first responders are left traumatised. A percentage of people vehemently oppose a change to legislation. They are generally bound by religious or ideological views, yet have particular sway in parliaments and over medical bodies, Hackett says. Those who oppose changing the law often make false claims, she says, including that assisted dying laws would damage palliative care or undermine the relationship between doctors and patients. ‘‘A common scare tactic is that it’s not possible to create adequate safeguards, but evidence from other jurisdictions shows that safeguards work and that vulnerable people aren’t being taken advantage of,’’ Hackett says. She argues that for people who oppose euthanasia, a first-hand experience can change even the toughest of minds. An Advance Care Directive is a document which sets out the desired medical treatment if someone becomes unable to communicate their wishes. 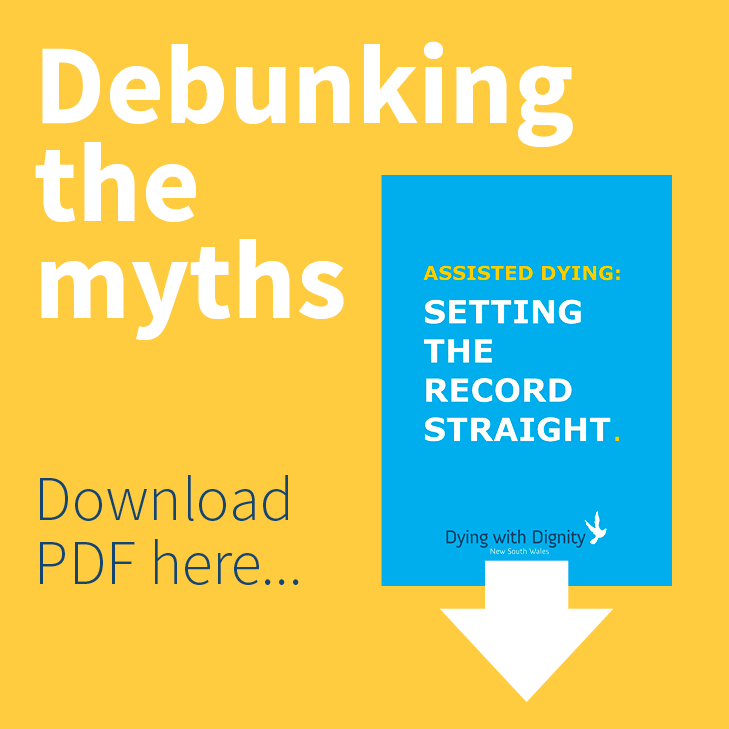 Dying with Dignity NSW has a comprehensive Advance Care Planning Guide, which includes two types of Advance Care Directives and the legal forms required to appoint an enduring guardian. ‘‘The most important thing is to have open and honest discussions with your loved ones about your wishes before it’s too late,’’ Hackett says.